Hello to all! We’ve put a lot of time and effort into improving the scanning mechanism, the Windows agent and many other program components. This time we’ve also paid special attention to improvements requested by our users. Please bid welcome to version 3.6.0! The TNI scanner underwent an in-depth tuning and refinement. We’ve completely rewritten the internal scanning mechanism: increased the stability of the whole process, expanded the network discovery mechanisms and significantly raised the scanning speed for medium and large networks. How events in the scanner are logged and how it interacts with Active Directory have been improved as well, with many other positive changes that will speed up the scanning process and make it more thorough and reliable. Scheduled scans will no longer be delayed because the scanner is busy with the previous task. They will start in the background exactly when you’ve planned! We’ve added more features to the Windows agent. Yes, we mean tniwinagent.exe that’s used when scanning remote computers from the Scanner tab and can also be run manually to scan the computer. You may also be using this file as an automated resident agent. So what we’ve done for this new agent version is updated its own scanner, added more fields to be collected and improved the interaction with the SMB protocol. Lastly, now it supports the new FTP/FTPS and SFTP/SCP protocols. All this was done to obtain as complete and reliable information about Windows systems as possible. In each update we try to pay special attention to fixes and improvements based on your feedback and requests. In Total Network Inventory 3.6.0, these changes have affected many parts of the program: interface, reports, temporary files, compatibility with Total Software Deployment, other elements have been corrected and improved thanks to you! In addition, we’ve finally solved a number of issues that may arise when corrupted files are present in the storage and, by optimizing internal processes, heavily improved the stability of the application as a whole. 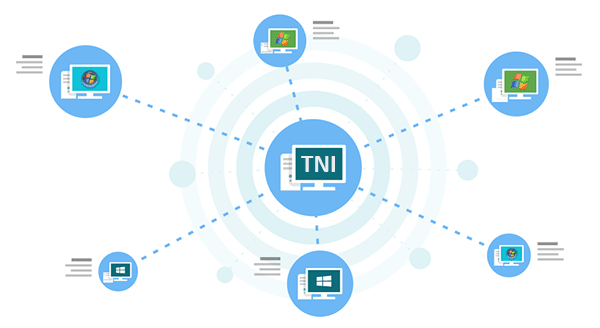 After these changes, TNI becomes considerably faster and even more stable. NewSilent installation/uninstallation mode in the resident agent. NewAbility to update the resident agent via FTP/FTPS and SFTP/SCP, as well as via SMB with authorization. NewSupport for file sending via SFTP/SCP after the resident agent performs a scan. NewCollection of information from the SystemSKUNumber field. New“Device name” field when exporting the Change log contents in the CSV format. NewTelnet and ESXi agent versions displayed on the About screen. ImprovedInternal scanning engine was totally reworked, resulting in better scanning stability and increased reliability of network device discovery. ImprovedScan scheduler now runs in the background, independently of the Scanner tab. ImprovedAuxiliary modules for working with SSH and SSL/TLS were integrated into the Windows agent. ImprovedSending files via FTP by the resident agent: TLS is always used if supported by the server (explicit mode), and for the implicit mode, specify “ftps: //” in the URL (also applies to updating via FTP). ImprovedAbility to create screenshots when scanning various types of devices that have a web interface. ImprovedInformation refresh when filtering the network tree. ImprovedDevice type selection lists now have a common look. ImprovedСompatibility with the network storage in TSD. Also more information is now collected for the software uninstallation module. ImprovedScanner operation logging system was expanded. FixedObtaining information about Windows Firewall and Windows Updates. FixedChecking for files when the resident agent is auto-updating. FixedProgram operation when the temporary folder is not found. FixedMissing option to delete logins in Edit – Logins. FixedProgram doesn’t restart after it’s closed when the license key is submitted. FixedRounding of the prices in custom fields. FixedUndefined device status after scanning. FixedRendering issues when deleting scan tasks. FixedIncorrect rendering of the storage selection window on the Windows classic theme. FixedPCI devices with the 0xFF class not being detected when scanning ESXi systems. FixedCertain unexpected program shutdowns, as well as the issues when working with corrupted files in the storage, were corrected. Overall stability of the program was increased. PS: Our team is now working on creating a network map feature and improving the scanning of SNMP devices. Stay tuned for more updates! Although there are a lot of improvements to the tniwinagent.exe the most wanted it is not (at least by me). I have asked for the ability of the scanning engine to detect that computers on remote ip segments with currently installed resident agent do not copy the agent every time a scanning task is performed. Instead, it should use the already installed tni agent on those remote computers if agent version is the same and if it is not then update remote agent and then perform the scan. You are right. This request is quite popular and it is still on our to-do list. We are sure that this and other popular improvements will be implemented in the program. Thank you for putting your trust in us.